TIFF has strategic investment capabilities in managing portfolios exclusively for non-profit institutions. TIFF has strategic investment capabilities in managing portfolios exclusively for non-profit institutions. TIFF is structured to provide non-profits with investment expertise that is intended to match that of institutions who have in-house investment teams. Our investment capabilities are aligned with the investment requirements and goals of our members: investing in a way that matches their mission while providing investment returns and income when needed. Every engagement starts with a simple goal – to understand our members’ needs. TIFF’s investment team puts our members' goals at the heart of every decision. to enhance the investment returns of endowed non-profit organizations. to seek returns for our members, so they can meet their goals. Rigorous internal review, extensive due diligence, and internal vetting by investment committee prior to each manager hire. More than two decades of experience evaluating, selecting, and monitoring investment managers. TIFF team structure modeled on largest endowment offices, with investment committee utilizing long-term, “asset owner” approach to decision-making. TIFF’s scale and multi-billion dollar AUM provides a deep research platform and the ability to access leading managers and negotiate what we believe are attractive terms and fees. Sourcing of ideas from extensive staff and board networks, existing TIFF managers, databases, and global travel. ESG considerations, including a manager’s approach to governance policies and board structure, environmental practices, and labor policies, are important to us and our members. TIFF strives to be the non-profit community’s most trusted investment partner. The primary objective of our Comprehensive Advisory Services is to enhance investment returns for our members while also reducing their costs and administrative burden. The core principles of our service are to provide a reputable, consistent and durable investment program that supports each member’s mission. 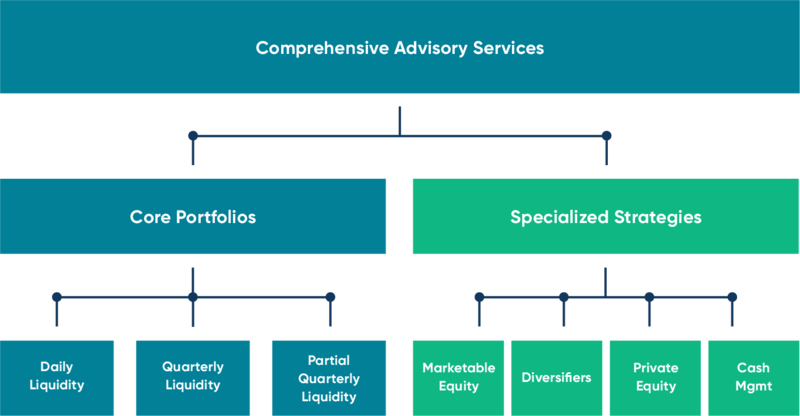 While TIFF has provided Outsourced Chief Investment Officer (OCIO) services for over 27 years, our Comprehensive Advisory Services model has evolved into a more complete and flexible approach to endowment management. We work exclusively with non-profit institutions and provide a distinctive approach that primarily uses the “endowment model” of investing as practiced by major universities and foundations. Our work is overseen by a Board of Directors primarily comprised of leading CIOs of major universities and foundations. 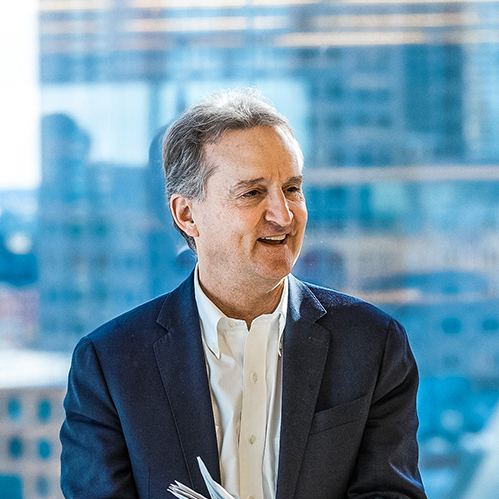 We use combinations of strategies (e.g., equities, fixed income) to develop investment solutions tailored to each non-profit member’s unique circumstances and mission. TIFF offers a broad spectrum of strategies across asset classes, designed for different member sizes and liquidity goals. TIFF’s approach includes three broad investment categories: equity-oriented assets, diversifying strategies, and fixed income. TIFF uses these components to deliver specialized solutions to our members or to construct comprehensive portfolios. Equity-oriented assets typical serve as the primary long-term drivers of portfolio returns. We pursue these in two forms, marketable equity and private equity. We employ a diversified approach to private equity investing across early-stage venture, US and non-US buyouts, global resources, credit-oriented strategies, and special opportunities. In addition to private equity, equity-oriented assets may include: global equity, high-yield bonds, resource-related equity, REITs, and real assets. Diversifying strategies are intended to generate meaningful returns while reducing equity market sensitivity. These strategies may include: hedge funds, asset-backed securities, commodities, and opportunistic credit. Fixed Income can provide diversification, liquidity, and income to a portfolio. These strategies may include: conventional bonds, TIPS, and cash.